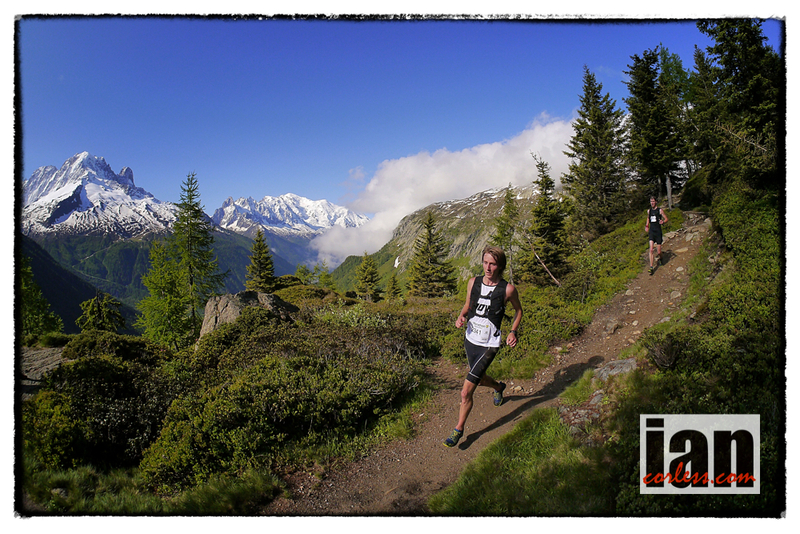 The Skyrunning Mont Blanc Marathon, part of the Skyrunner® World Series weekend has really been a truly incredible experience. 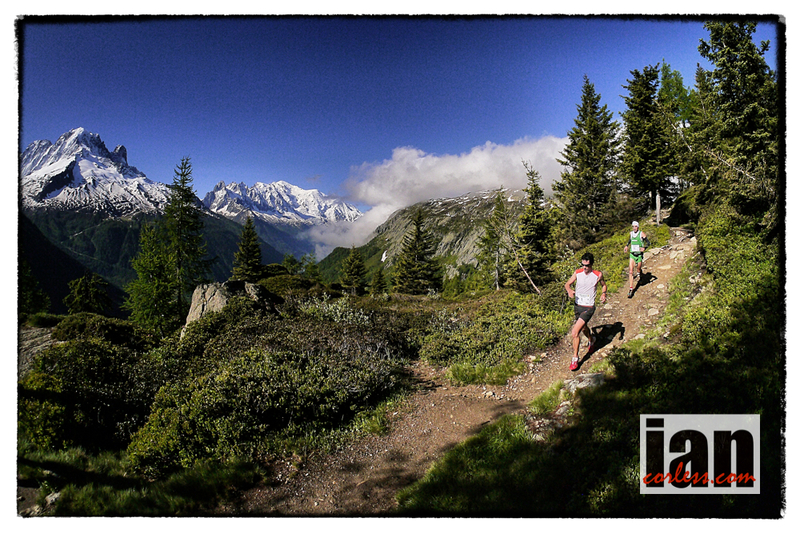 Mont Blanc, location of the 2014 Skyrunning World Champuionships, the 2013 event was so much more than a test run for next year! Today however, Sunday, was the classic marathon with a stellar field toeing the line to tackle a tough but fast course over the Mont Blanc mountain range. Wet and misty weather from Saturday cleared to one of the most glorious days in the mountains I have had the pleasure to witness. 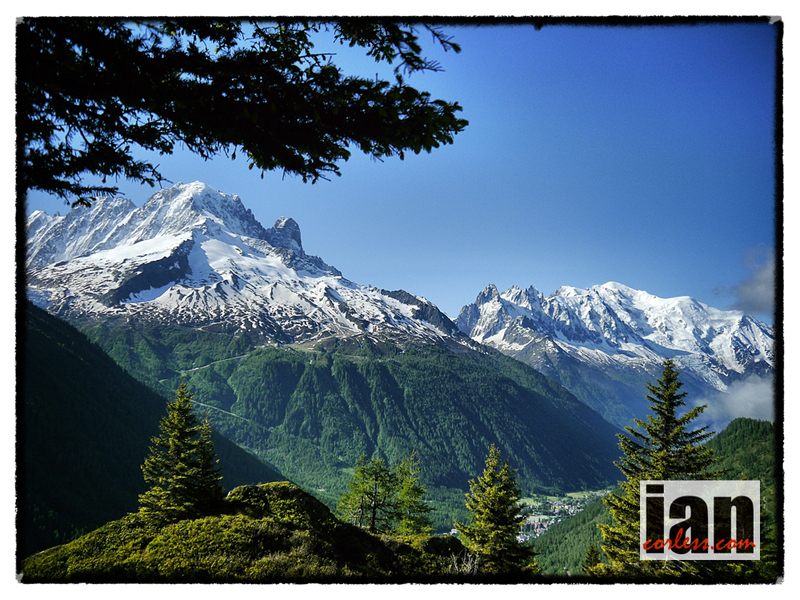 If you have never seen the Mont Blanc mountain range, a photo may give an impression but the awe inspiring majesty of these enormous beasts is a sight to behold and remember. They are truly incredible. 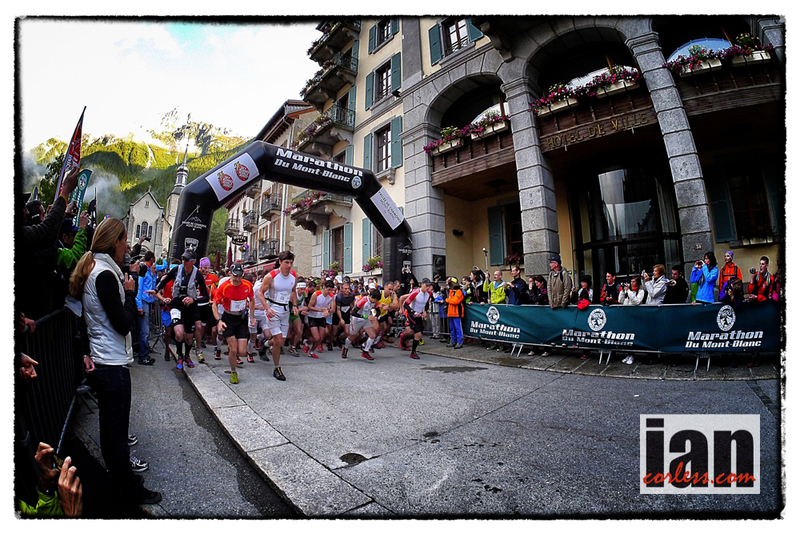 At 0700 two thousand runners departed from the square in Chamonix. The early pace was relentless over the first 10km’s due to relatively flat and very runnable terrain. 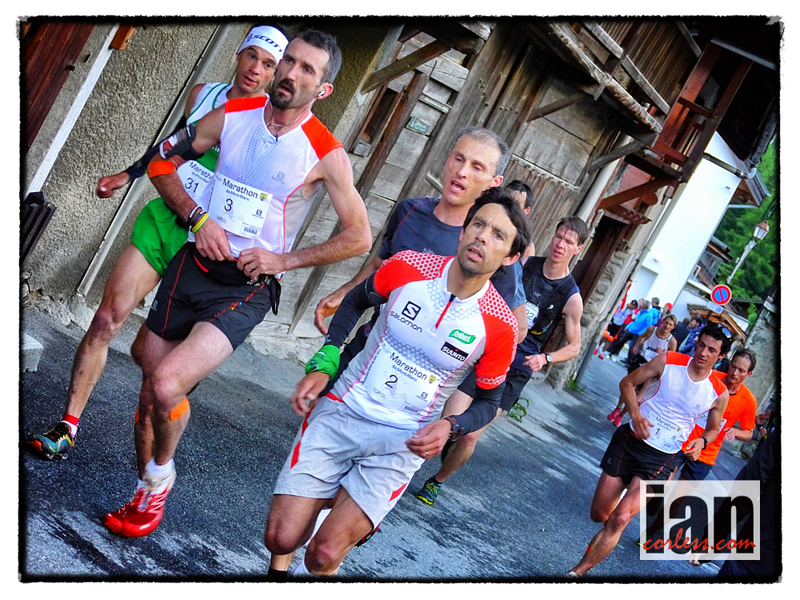 A lead group of men sped past at Argentiere pushing the pace hard. As expected, the main protagonists of the day were present; Kilian Jornet, Marco De Gasperi, Luis Alberto Hernando, Florian Reichert, Nicola Golinelli, Didier Zago, Alex Nichols, Tofol Castanyer and Salomon Team Manager, Greg Vollet amongst other. First lady was Stevie Kremer. Pushing the pace hard very early on she shouted as she passed, “they are not far behind”. 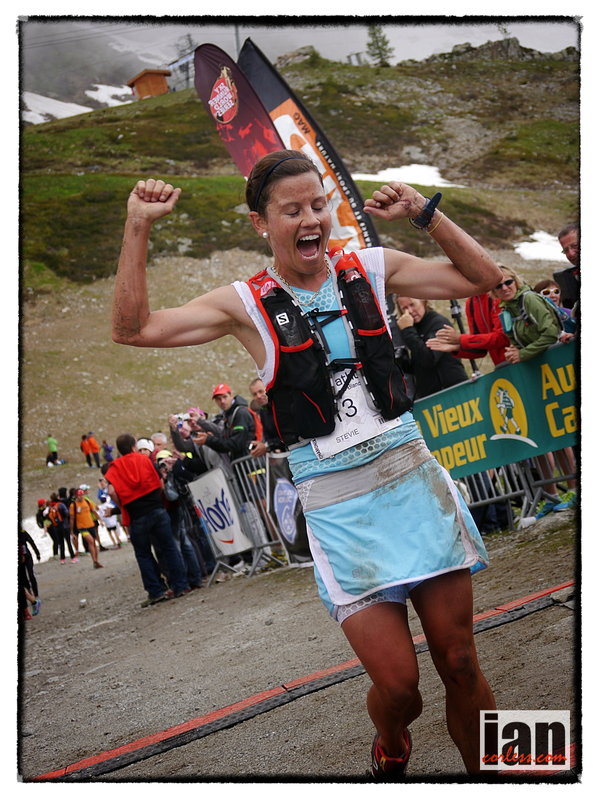 As it happened, at this early stage in the race she already had a ninety second lead over Emelie Forsberg. On the trails the terrain changed and started to undulate. Kilian Jornet, Marco De Gasperi along with Luis Alberto Hernando and Nicola Golinelli started to pull away from the rest of the filed. Stevie Kremer extended her lead from ninety second to three minutes and this pattern continued. 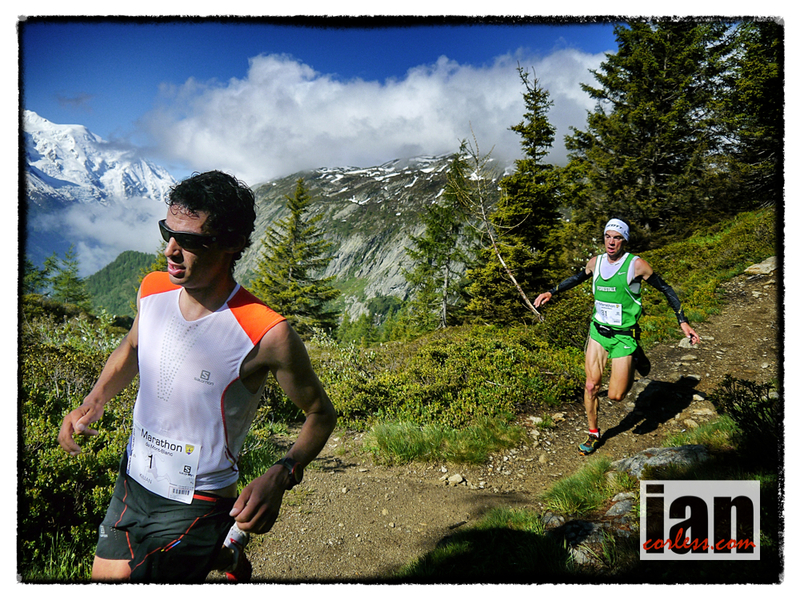 At the Col de Posettes the race was blown apart with Kilian Jornet and Marco De Gasperi pushing each other stride-for-stride. Four minutes later Luis Alberto Hernando arrived. Nicola Golinelli was pursued by team mate Didier Zago and then we had Alex Nicholls and Florian Reichert. The pace was relentless. 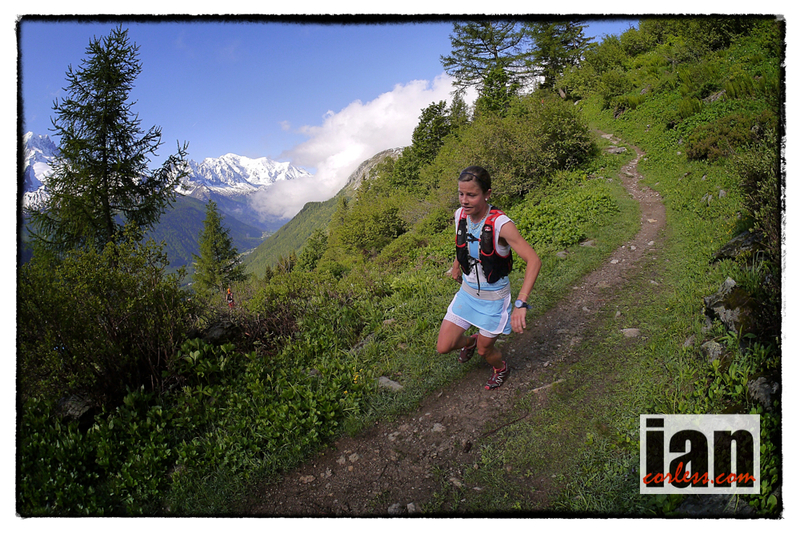 Stevie Kremer flew down the descent and I waited… three, four, five, eight, ten and then Emelie came in sight… she was ten minutes and thirty seconds behind Stevie. Quite incredible! Emelie did say post race that she was having stomach issues, “I take nothing away from Stevie’s incredible performance, but today I just couldn’t push, I had no additional energy”. 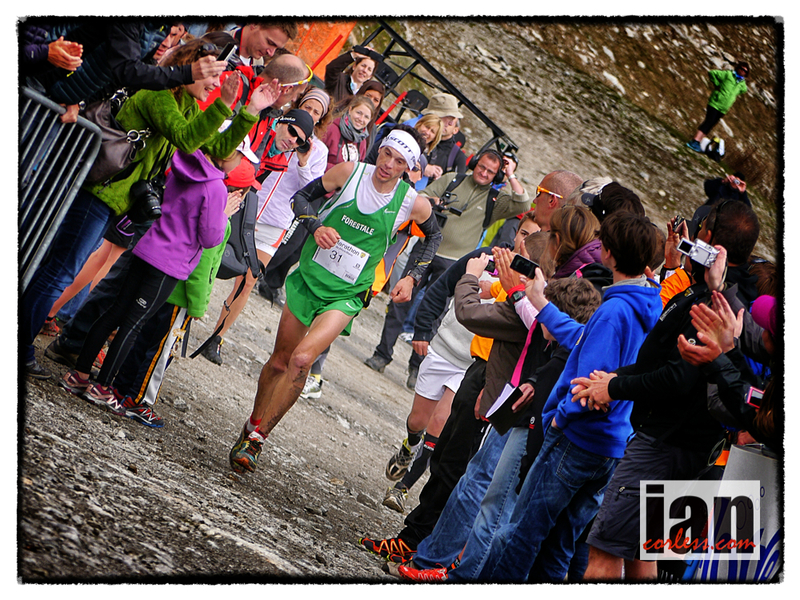 From Tre les Champ at 1363m and approximately 32km into the course, the final 10km was all uphill! A relentless climb was broken with some relief just after Flegere before the final push to the summit finish at Plangraz, 2016m. 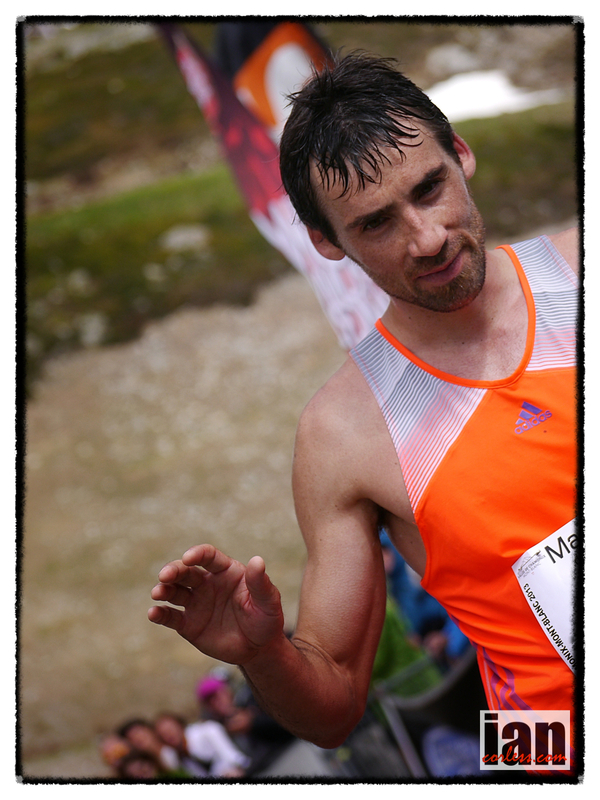 First around the bend was Kilian Jornet. Waving to the crowds he approached the line, turned, gave his usual one arm wave and then bent double as he tried to recover from the effort, 3h30’41 a new course record! Marco De Gasperi was second just over a minute later. the two sparring partners had pushed each other to the line and in the process had once again provided an incredible racing spectacle that we can only look upon in disbelief. Luis Alberto Hernando completed the podium. Post race he expressed his thoughts, “I have been training for longer races and I found the early relentless pace difficult to keep up with. However, from half way I improved and felt good. Maybe I am a little tired?”. Stevie Kremer absolutely dominated the ladies race and blew the old course record off the scale by some twenty five minutes, her time of 4h03’16 placed her within the top 20! As she approached the line she could finally relax and that incredible smile appeared on her face. It was a stunning performance and one that many of us will never forget. Emelie Forsberg arrived twenty two minutes later, despite her issues during the race she smiled and waved to the crowds. Emelie in her meteoric rise in the sport has become a firm crowd favorite and the cheers from all who watched acknowledged this. 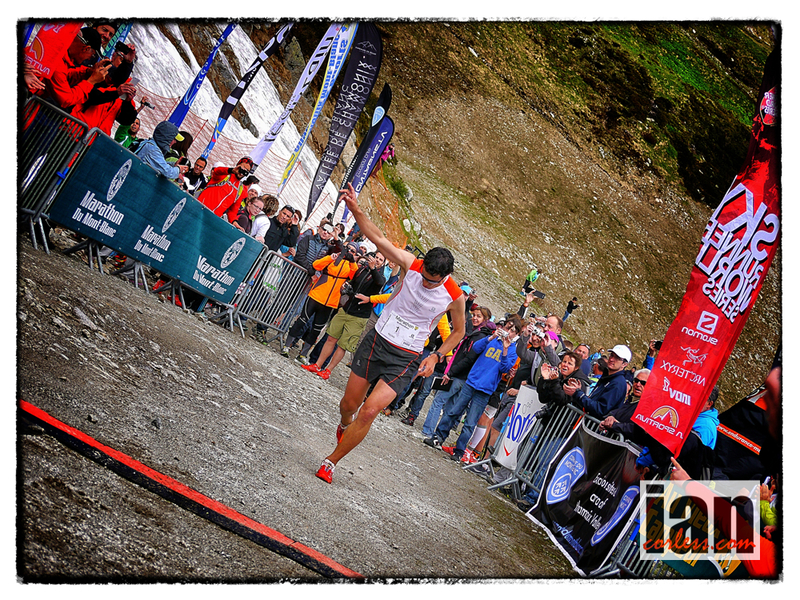 Notable mentions must go to the incredible performances from the inov-8 International Skyrunning Team and Arc’teryx, both placed runners in the top ten. 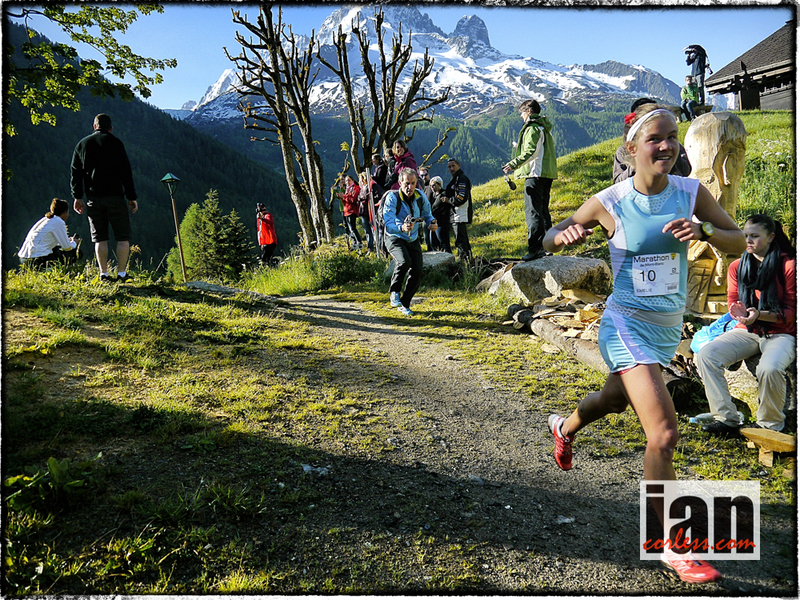 This entry was posted in Uncategorized and tagged A day racing in Chamonix, Alex Nichols, Celine Lafaye, didier zago, Emelie Forsberg, Florian Reichert, Greg Vollet amongst other., Images from Mont Blanc, ISF, Kilian Jornet, Luis Alberto Hernando, Marathon, Marco de Gasperi, Mont Blanc Marathon Race Report, Mont Blanc Marathon Race Summary, Nicola Golinelli, Salomon, Scott, Silvia Serafini, Sky, Skyrunning, Stevie Kremer, Tofol Castanyer and Salomon Team Manager by talkultra. Bookmark the permalink.